08.16.09 = Most of you know this little guy; The Big Boy. 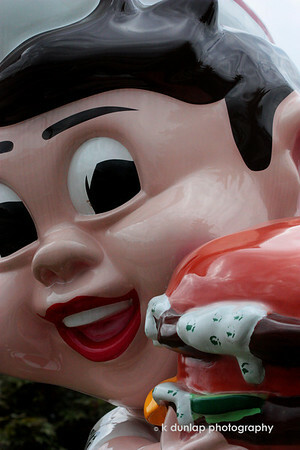 Here in Cincinnati, we call him the Frisch's Big Boy. That is the name of the family that runs the Big Boy chain here. It's a local icon. If you have never been to Cincinnati, I'm sorry, your are really missing out on some fantastic food. Cincinnati is one of the top cities in the country for local dining out. Stay tuned for some fantastic food this week! Yep - in So CA we had Bob's BB...the concept was definitely the same, but I remember the "boy" looking slightly different than this one. Great photo! Ditto Chuck Beehner! We used to love going to the BBB drive-in! I grew up with a McDowels Big Boy. I haven't seen one for ages. Nice comp on him. We used to have "Bob's Big Boys" out here...a long, long time ago...similar figure.